Phenomenal People is organising its first annual walk on the island of Arran. It’s a chance to experience a two day mini-adventure through the beautiful landscapes of Arran taking in camps at Glen Rosa and Sannox, a walk up and over Goatfell, a walk around the scenic north east coast of Arran and a BBQ on the beach: all in aid of supporting Phenomenal Poeple and its important work with Young Carers in Scotland. With guiding provided by Alastair Ewen from Aspen Outdoors Ltd the plan is to travel over on the ferry from Ardrossan on the evening (6pm) on Friday 12th of May. Evening meal on the ferry on the way over. When we arrive on Arran we’ll drive to Glen Rosa campsite. 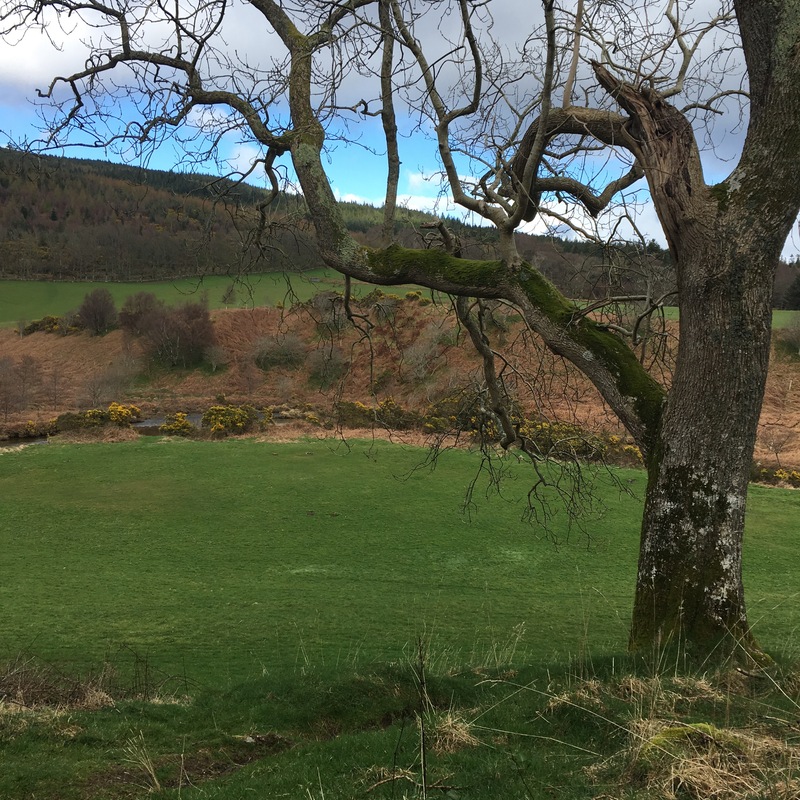 This campsite (below) has basic facilities (toilets and running water) and has a wild camping feel to it: it’s informal and relaxed and there’s plenty of room to find a place to pitch your tent. On the Saturday we leave our overnight gear in the minibus and walk with daypacks up to the highest point on Arran, Goatfell (874m). From there we walk north along the summit ridge, past Nort Goatfell and to the Saddle, a col between Glen Rosa and Glen Sannox. From there we descent down to the village of Sannox and a lovely grassy campsite by the sea (the site has toilets). Altogether the route is 14km with about 900m ascent. The route up Goatfell is on a good path but once on the summit ridge the route is rocky with some loose rock in places. The descent from North Goatfell and the Saddle is a little steep so good walking boots are needed. 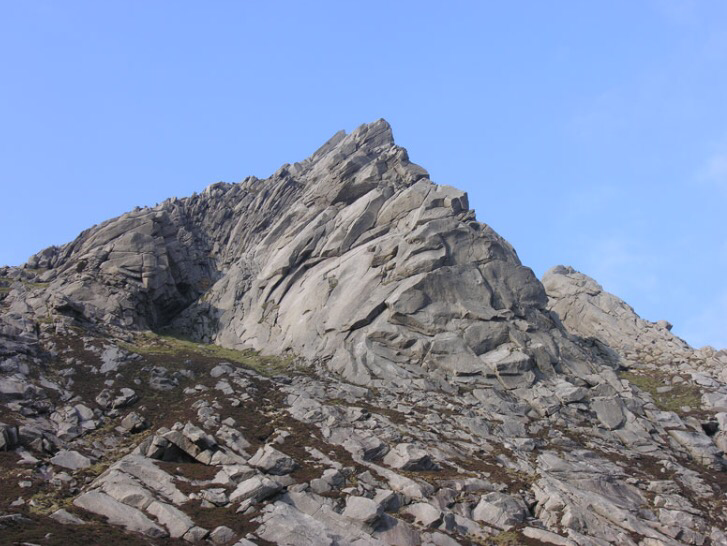 The summit of Goatfell and the high ridge to North Goatfell is dramatic with amazing views. At our campsite in Sannox our overnight kit (tents etc) will be waiting for us when we arrive. In the evening the plan is to have a campfire and BBQ on the beach. Remember to bring marshmallows! Depending on the walking experience of the group, there’s the option of an easier trek through Glen Rosa to the Saddle and then down to Sannox, avoiding the high peaks. This alternative route passes by some beautiful pools in Glenrosa Water. You’ll also get a good view of the Rosa pinnacle, a huge granite rock tower popular among rock climbers (below). This alternative route is also 14km but has less ascent (450m). 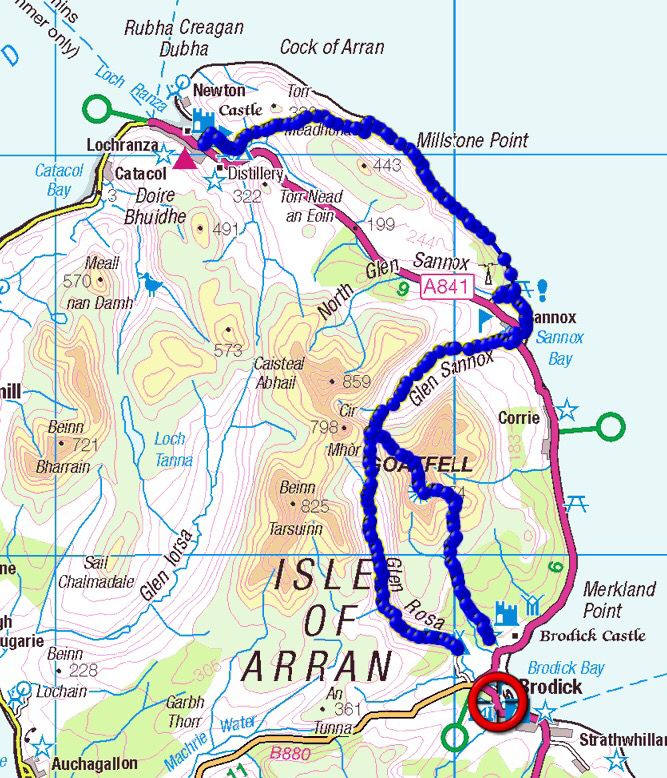 On Sunday we’ll have a shorter day, a 10km coastal walk to Lochranza. Again we’ll leave our overnight gear with the minibus and then head north along a coastal path to Laggan cottage. As we walk along there a chance of seeing seals and seabirds and maybe a few early wildflowers. Once at Laggan the path climbs up over the hills that form the east side of Glen Chalmadale. The gentle descent to the Glen and Lochranza is lovely walking with great views. Once down in the valley we’ll meet the minibus and head back for the afternoon ferry from Brodick (4:40pm). In terms of difficulty Saturday’s walk is a bit harder than doing Ben Lomond, because of the terrain on the summit ridge, but in terms of distance and height gain it is about the same. Food for Saturday evening BBQ will be provided. Please complete the following online form so that Aspen Outdoors Ltd can gather information on your hiking experience, any medical conditions and emergency contact information. 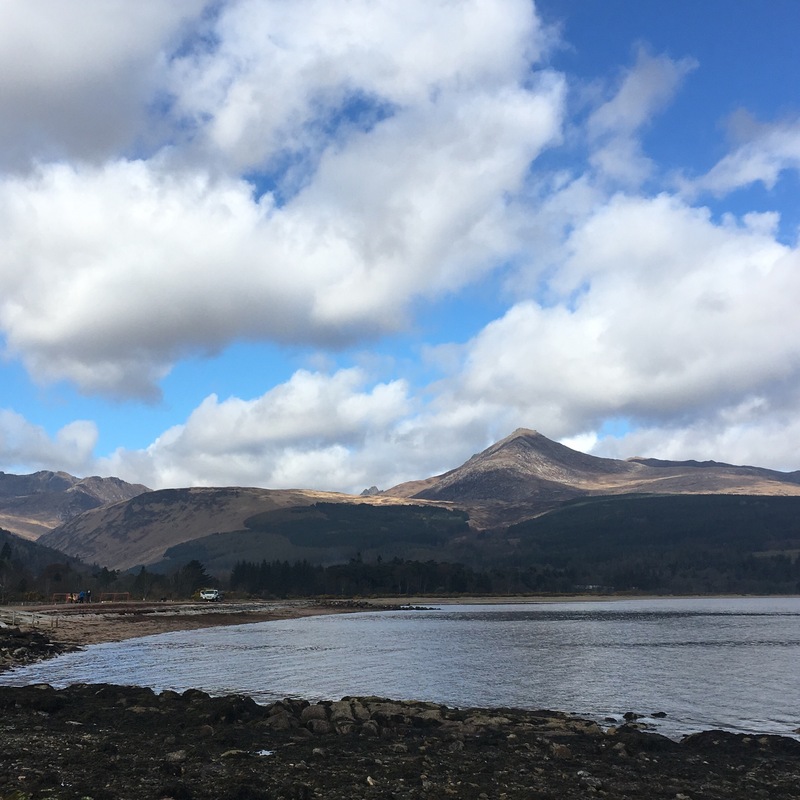 Once you have opened the form please select ‘Phenomenal People Mini Arran Adventure’ in the event title field, complete the form then click submit. Please ignore reference to payment – Claire is organising that. For more information on the weekend and the cost please contact Claire O’Neil from Phenomenal People on 07388 045427.